My hunt for an ideal pair of Bluetooth in-ear headphones is still ongoing. This time, my choice went to Bose SoundSport Wireless. It’s a relatively new model from Bose, promises 6 hours of battery life and the usual Bose-level of comfort. These headphones are not truly wireless because it still has wire connecting the left and right pieces, but I find it close enough. Having no cable between our head and our phone feels liberating, and the only connecting cable has nice length we can just put it behind our neck. First, why Bose? I realised that for everyday gadget, comfort is far more important than sound quality in several minutes of critical listening. Comfort is one area where I usually find Bose products satisfactory. I could wear Bose headphones for long hours and still feel comfortable about it. This model delivers the same experience. There are 2 models of SoundSport Wireless: the Pulse model tracks our heartbeat. I opted for the normal model without heart rate sensor. I have my Fitbit for that. The right-piece of Bose SoundSport Wireless has one single power button and a protected micro-USB port for charging. Even though I like the fact that one full charge would last 6 hours, I am not excited with the fact that it takes 2 hours for the charging process. The remote unit is located near the right-piece, it has 3 buttons (volume up, volume button and play/pause), a mic and NFC chip for quick Bluetooth pairing with compatible devices. There are 3 colors available: black, aqua-black and citron-white. I choose the most conventional choice that would go well in most situations: black. Was tempted to get the citron-white because I like white cable, but I’m not really into that bright yellow “citron” color. 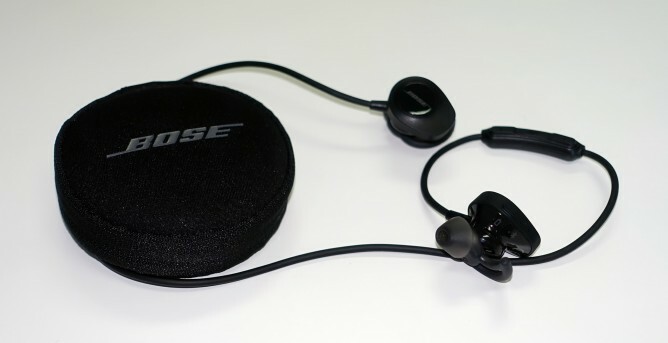 Installing Bose Connect app in our iPhone or Android devices would allow us to gain few extra features from these headphones. We can easily choose which devices it should connect to. And we can upgrade to new firmware when available. From the moment I received these, I already upgraded my headphones’ firmware twice. The ability to choose which devices to connect to, is arguably the most usable feature in day to day situations. Most people would have at least 2 devices, whether it’s phone and tablet, or phone and computer. When I connect my computer to my headphones, sometimes I would miss important messages in my phone. Bose SoundSport Wireless has Multi-point technology, it can maintain a connection to two devices at the same time. So I could work on my computer while listening to music and will not miss a single notifications on my phone. Bose SoundSport Wireless is comfortable to wear. At least 3 hours of continuous usage was tested and there was no comfort issue. I also like the fact that these headphones will automatically turn off if there is no sound for X minutes, and we can choose the setting for X in Bose Connect app. Next: sound quality. Let’s say it’s typical Bose. The sound is nice and stable. It packs good punches without overpowering. It’s detailed enough yet not too sharp. Probably not the best kind of sound quality when we’re talking about critical listening, but it’s the kind of sound that you wouldn’t mind to listen for hours without feeling worn out. The sound isolation is perfectly balanced. It’s enough for me to hear my music nicely, but I can still hear some loud sound around me, which is quite important to stay safe outdoor. Note that I use these headphones mainly for everyday commuting instead of for sport. People using these for sport would probably has different experience. If there’s one thing I would complain about these headphones: it’s the size of left and right pieces. They’re a bit oversized and would appear outside our ears when worn. I guess they need to put the battery and the components somewhere. Don’t get me wrong, they are not heavy at all. It’s just not the kind of discreet look we usually get from in-ear headphones. After testing these headphones in the first few days, I quickly forgot most of my other headphones. Bose SoundSport Wireless easily steal the spot of my go-to headphones for everyday use. It’s small, lightweight, compact, has decent battery, very comfortable and sounds nice. What else would you expect from everyday headphones? Definitely a keeper.